Vgrooves are a traditional decoration of custom mats. They are created by cutting a bevel cut half through the mat and then returning to cut the mirror image of the bevel cut in such a way that the bottom of the two cuts meet each other creating a "v groove" in the surface of the mat. With the advent of computerized, knife cutting machinery; we can do much more than a simple v groove around the window of that mat. We can now create beautiful mat design that not only accentuate the mats, they can set the mood for your image. You can create designs that reproduce old designs on mats with vintage photographs or create modern designs that bring an image to life. Come back often to see our expanding vgroove selection and sizes. Click on design below to see more v groove offerings. The following 8x10 vgroove mat designs are available on demand. A decorative process that was first a hand-carved craft and then was duplicated in simple "outlines" of a mat window, are now available in more diverse and more sophisticated mat designs that not only accentuate the mat, they can set the mood . 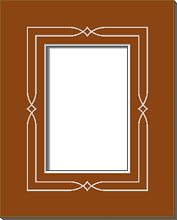 This makes the picture frame mat an integrated part of the image. Select one of the 8x10 designs below. All mats use our acid-free and lignin free Tru-White™ core mats. Matboard is treated with calcium carbonate to fight against acidity and are 4 ply mats measuring .050-.055 thick. We also encourage custom designs of your creation. 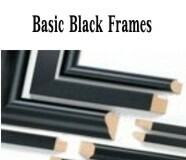 Contact us at info@matcutter.com for your next framing project.